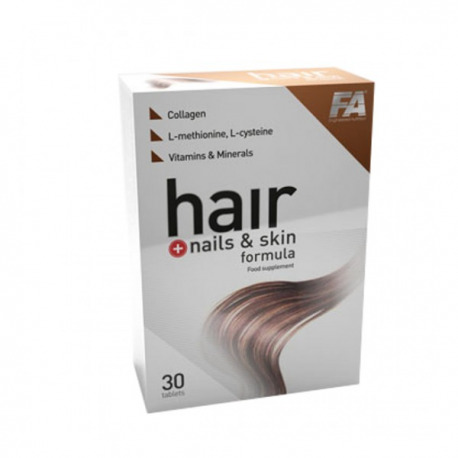 Return to Home > Pro-Gezondheid>FA NUTRITION HAIR FORMULA - 30 TABL. 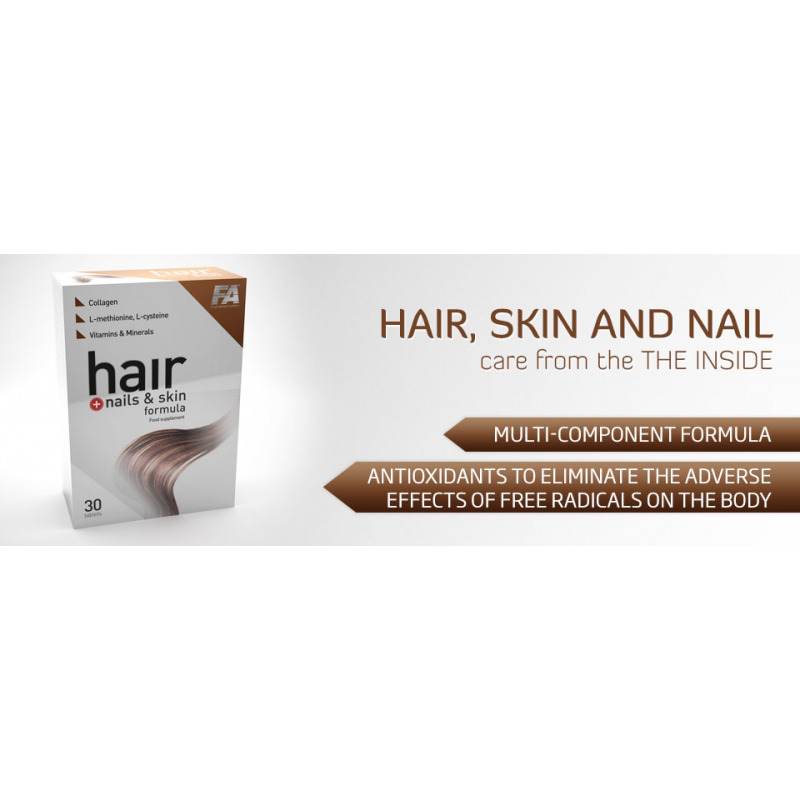 Hair + Nails & Skin Formula is a complex supplement supplying the diet with vitamins, minerals, amino acids and natural collagen, which provides components helping skin, hair and nails in proper functioning. The product is designed especially for women for whom a healthy and beautiful hair, skin and nails are the basis of good mood and high self-esteem. Skin, hair and nails say a lot about our overall health. The look of nails - color, shape, thickness tell us a lot about the condition of our body. Neat nails accentuate hands beauty and their look and shape can be influenced by eating disorders, nutritional deficiencies, metabolic and vital organs diseases, but sometimes also external factors such as humidity and temperature. The lack of valuable minerals and vitamins in the diet causes adverse changes in nails look. They become matt, brittle, delaminated and are susceptible to various diseases, additionally there are stripes and white spots on the nail plate. When your nails are dry, brittle, covered with furrows, it means that you have not enough biotin, which is necessary for proper construction of nail plate. Deficiency of vitamin C and folic acid can be one of the causes of the nail wall inflammation. Vertical ridges on nails - looking as if the nail was breaking, can be a sign of deficiency of vitamin B. Pale nail plate may suggest anaemia. If anaemia persists for a long time, nails can start to break, change shape, become completely flat. White spots on the plate may be caused by the lack of zinc. Dry, flaky skin - may be a symptom of various dermatological diseases but also an effect of biotin, iron, zinc and vitamin A deficiency (involved in the synthesis of collagen and is responsible for proper functioning of the epithelium). Every woman should have a beautiful and well-kept hair. However, it often happens that hair are losing the gloss, it gets hard to style them, they begin to fall out. This may be a sign that something bad is happening inside our body and very often the reasons are: poor diet, lack of good quality proteins, vitamins and minerals. The lack of not good enough proteins in diet can cause disappearing of the root and the shaft will become thinner. Therefore, the protein should be high-value, which means with well-balanced amino acid composition. This protein is found in fish, meat, soy protein or in the peanuts. The most important amino acids for hair are cysteine, methionine and tryptophan. Dry, brittle hair are a sign of the lack of zinc and vitamins B5 and B6, and iron deficiency may indicate hair loss. Copper deficiency leads to discoloration and structural changes in the hair. Shark Cartilage provides a complex containing natural collagen including chondroitin sulphate. These are the ingredients that are in our skin, nails, hair, ligaments, tendons, joints and blood vessels. Fish collagen is a natural protein derived from fish skin. Collagen is the most important protein in human body, because it makes 30% of the total weight of the human protein and 70% of skin proteins. Collagen is the main constituent of the skin, nail, hair, ligaments, tendons, joints, cartilage and bone tissue and blood vessels. The collagen fibres provide flexibility, elastics and also high strength of many structures of the body, including skin, hair and others. 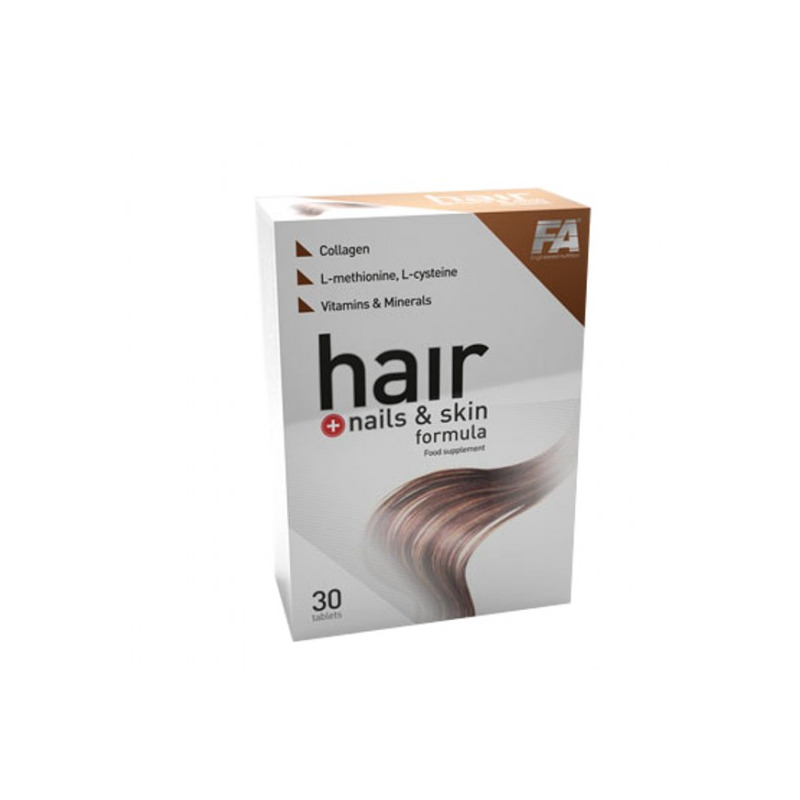 L-cysteine and L-methionine are a special sulphur amino acids that forms the "disulphide bridges", responsible for the structure and strength of hair and nails. They are part of collagen- responsible for skin and creatine elasticity - building material of hair and nails. Vitamin C helps in the normal production of collagen in order to ensure the proper functioning of the skin, it helps protect the cells from oxidative stress. Vitamin E helps protect cells from oxidative stress as well. Vitamin B2 helps to keep skin healthy and to maintain normal iron metabolism and as well as Vitamin C and E helps protect cells from oxidative stress. Niacin helps maintain healthy skin and proper condition of the mucous membranes. Folic acid participates in the process of cell division, it helps in proper functioning of the immune system, helps in correct synthesis of amino acids and helps to maintain normal metabolism of homocysteine. Vitamin B12 takes a part in cell division, contributes to the proper functioning of the immune system and metabolism of homocysteine, also helps producing red blood cells. Biotin helps to maintain healthy hair and skin. It is involved in the metabolism of proteins and fats, but also in the synthesis of fatty acids and the absorption of vitamin C.
Copper is an element that helps maintain a healthy skin and hair pigmentation and helps to maintain the correct state of tissues. It helps in protecting cells from oxidative stress and helps in proper functioning of the immune system. Zinc helps maintain healthy hair, skin and nails also helps to maintain normal metabolism of vitamin A. It helps in the proper synthesis of proteins, DNA, is involved in cell division, helps to maintain normal metabolism of proteins, carbohydrates and fats. In addition, zinc helps in the proper functioning of the immune system and helps protect cells from oxidative stress. Grape seed extract, as well as vitamins C and E are natural antioxidants that help protect human cells from oxidative stress. In addition, vitamin C helps in proper production of collagen in order to ensure the proper functioning of the skin. Ingredients: Shark cartilage, fish collagen, bulking agents (tricalcium phosphate, microcrystalline cellulose), L-cysteine, vitamin C (L-ascorbic acid), zinc gluconate, L-methionine, silicon dioxide, anti-caking agents (E464, magnesium stearate), coating [bulking agents (hydroxypropyl methyl cellulose, polydextrose), colours (E172 (ii), E172 (i), E172(iii), E171), talc, maltodextrin, medium chain triglycerides (MCT)], grape seed extract (Vitis vinifera L.), vitamin E (D-alpha tocopheryl acid succinate), niacin (nicotinamide), pantothenic acid (D-calcium pantothenate), cupric sulphate, vitamin B6 (pyridoxine hydrochloride), vitamin B2 (riboflavin), vitamin B1 (thiamin hydrochloride), vitamin B12 (cyanocobalamin), folate (pteroylomonoglutamic acid), D-biotin. Recommended use: Take 1 tablet a day after meal. Not chew. Warnings: Do not exceed the recommended daily dose. Do not use if you are allergic to any ingredients contained in this product. Do not use if pregnant or nursing. Food supplements should not be used as a substitute for a varied, well-balanced diet. A varied and balanced diet and a healthy lifestyle are recommended. Store in a cool, dry place, away from direct sunlight. Keep out of reach of children.